Some recipes are not found in any recipe books or cooked in hotels and restaurant and are usually made in peoples homes, handed down over generations. What makes them alluring is their age old timelessness. Considered to be too simple to be noted down at times, there is the possibility of them being lost over time, considering the multifarious choices available to us today. There are recipes that makes a family come together, sit around and chat. Or recipes that give you the comfort of home when you are far away from home. Today, we are talking about one such recipe. During one visit to Bangalore, my mother-in-law made this dish that has been made in my father-in-laws family for generations and I was overcome by its simplicity and the exciting flavours of the unusual combination. Dont be fooled by either, the plainness of the dish or the unexpected marraige of flavours! 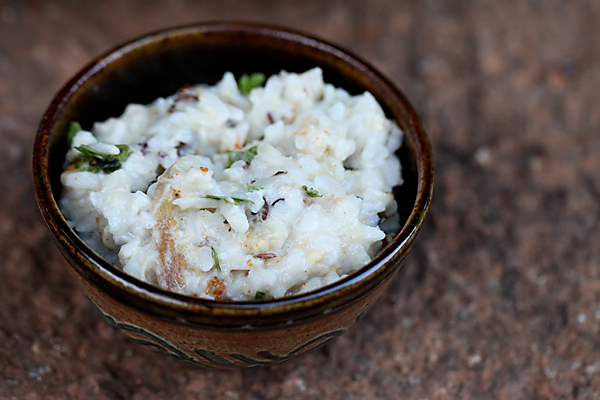 This rustic village food from the northern parts of Karnataka (a south Indian state) scores on all fronts. The cooling creamy yogurt with the zingy spicing and the soft mellow flesh of the eggplant combined with the hearty texture and taste of the flattened rice create a taste that cannot be easily forgotten. The downside of this preparation is that you won’t find it in any hotel or restaurant even if you go to where it originates, the northern parts of Karnataka. And that means you have to make the efforts to cook this up if you ever want to taste it. The plus side being you wont ever regret it. This is a very flexible recipe. 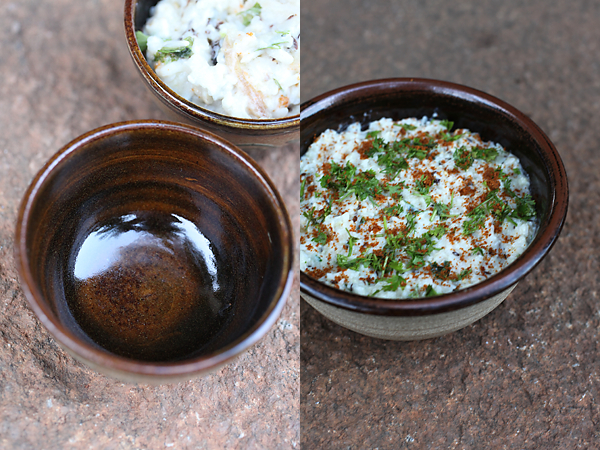 Adjust the consistency of the yogurt and seasoning to your choice depending on how liquidy or spicy you want it to be. 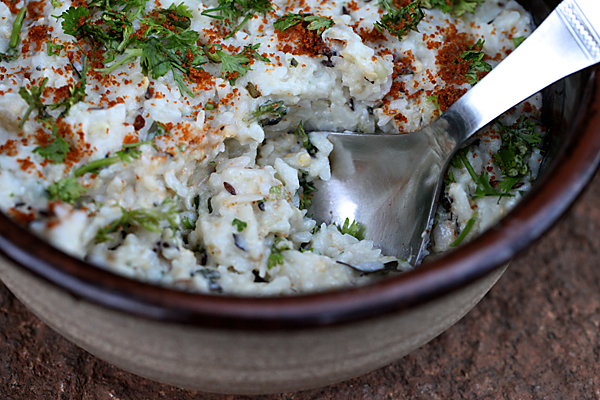 The flattened rice goes on absorbing the yogurt at a rapid pace, making it soggy very quickly. So this is best assembled just before eating and does not store well even for a brief period. Smear a little oil over the eggplant and keep it over a flame, turning it around all the time using a pair of tongs, until the skin starts to peel, about 15 to 20 minutes. Allow to cool. You could cover the eggplant in foil if you want to prevent a mess around the gas area. You could also roast the eggplant in an oven. Cut the eggplant in two halves and place the, flesh side down on a greased baking sheet. Roast for about 15 to 20 minutes at about 200 C.
Once cooled, remove the charred skin and cut into segments, reserving the residual juice. In a bowl place the yogurt and add about 1/2 cup of water. Blend to a smooth paste using a wire whisk. In a small wok or seasoning pot, put in the oil over medium heat. Before it starts to smoke, lower the flame, stir in the cumin seeds and when they turn golden, put in the ginger and green chilies and stir for a few seconds. Mix in the curry leaves and the asafetida and turn off the heat. Pour the seasoning into the yogurt and mix well. Add the flattened rice, the prepared eggplant and adjust the salt according to choice. Add more or less yogurt and adjust consistency as desired. Garnish with coriander leaves and red chili powder and serve immediately. We make this regularly at home, especially on days when we are fasting 🙂 Adding eggplant is a new one for me though… I'll be sure to try out your version the first chance I get! 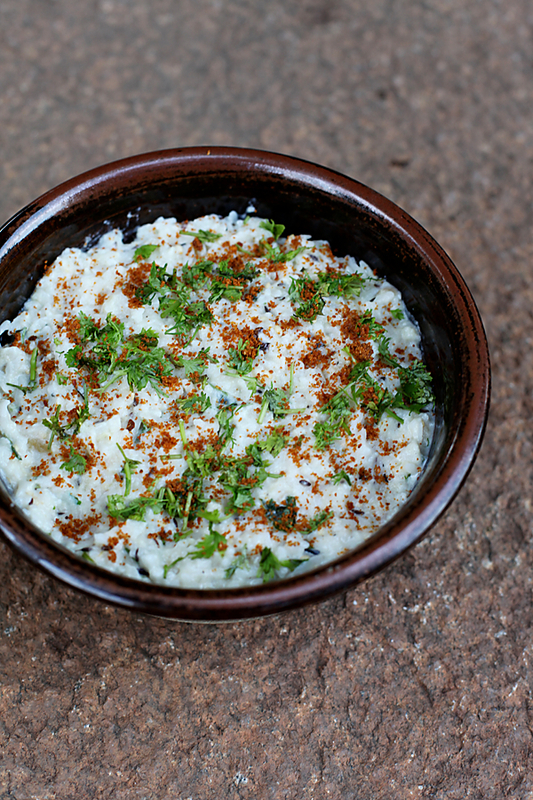 Mosaravalakki is a favourite at home! That addition of chatnipudi makes me nostalgic…Although never tried it with eggplant. I will do that next time. Shouldn't we cook the poha? Looks like an unusual dish..great pics! I love the idea of adding roasted eggplants to this class dish! Vatsala: Adding the eggplant is what gives the twist. We never use flattened rice or poha during fasts as it is a grain and consume only non grain items. Durga: No there is no need to cook the poha if you use medium thick poha. The moisture of the yogurt is enough to soften it. Anushruti, thank you for this wonderful recipe. I made this yesterday and it was really delicious and satisfying. It was really simple to make too. The only thing I had a bit of a problem was when I tried to remove the charred skin from the eggplants. Bits of it kept sticking to my hand and a bit of residue got mixed up with the juice. Is there a simple method to do it? In any case, it is not a big deal and I can see myself making this regularly from now. Thank you once again for such a superb recipe…there is nothing better than simple, delicious food after a tiring day. Wow! 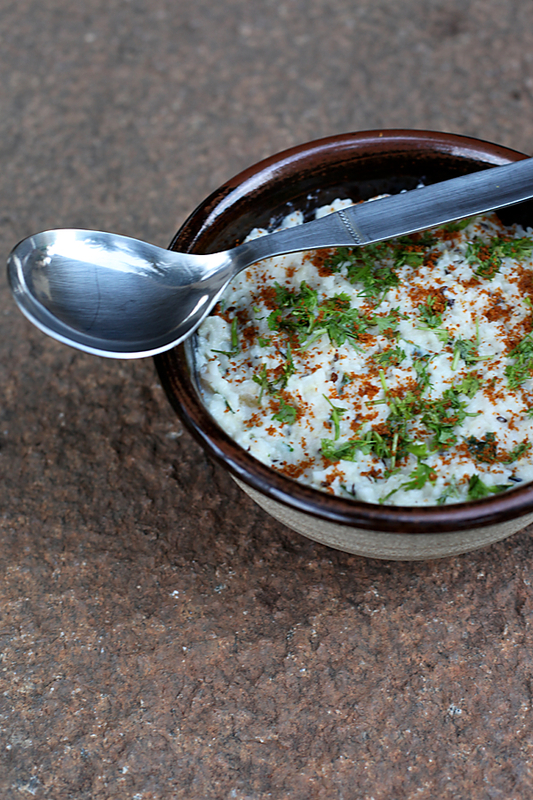 Dahi Pohe…or mosaru avalakki…..This is 1 of the reasons why I'm in love with Divine TASTE….Such simple and day to day recipes….seem so exotic…once they r on DT. Truly alluring and it looks delicious! I have a question. The yoghurt i make at home is not very creamy as i make it with toned milk. Can i use the store-bought yogurt like Amul or Nestle for this recipe? Poornima: If the skin of the eggplant is completely charred and the roasted eggplant is cooled well before peeling, then the skin easily comes off. Don't worry about very little bits if they happen to make their way into the dish. Totally agree with you about simple food being so satisfying after a tiring day. Shruti: Thanks for all the love. Kavita: Ofcourse you can use store bought creamy thick curd. I was just wondering what else could be substitute for eggplant in this recipe, as I am from nort n can't think of eggplant n poha combo n moreover at my place eggplant available r not tha5 tasty . 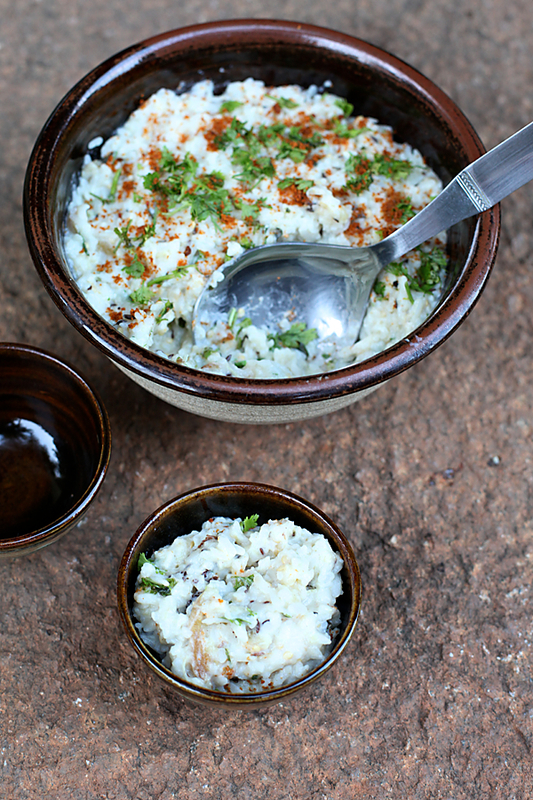 Ny suggestion as I wann try this recipe for its simplicity n curd n rice combo. pakhee- I somehow missed this message. Instead of eggplant you can use cabbageor any other soft vegetable. You could even skip the eggplant and enjoy this dish without it.